The UK National Health Service is currently buckling under greater demand than it seems to be able to cope with. This was demonstrated yet again at the beginning of this year, when Prime Minister Theresa May took the unprecedented step of apologising to the thousands whose non-urgent operations were postponed until the end of January due to a post-festive hike in the demand for care. The press also recently reported that approximately 16,900 people over the Christmas week were required to wait in the back of ambulances before gaining admission to overcrowded A&E units. This is a massively negative state of affairs for those relying on NHS healthcare for their wellbeing. At the same time, the increasing need for people to manage their own conditions without frequent access to a qualified practitioner provides an opportunity for the development of some extraordinary, patient-centred digital comms solutions. As reported in recent issues of Land Mobile, this often takes the form of ‘monitoring’ technology, for instance to track the whereabouts of those suffering from dementia. Many new solutions also provide the means for both monitoring and self-treatment of ongoing conditions, both physical and emotional. One of these is the OliTool, a handheld device linked via Bluetooth to an app, developed to help those suffering from anxiety disorders. 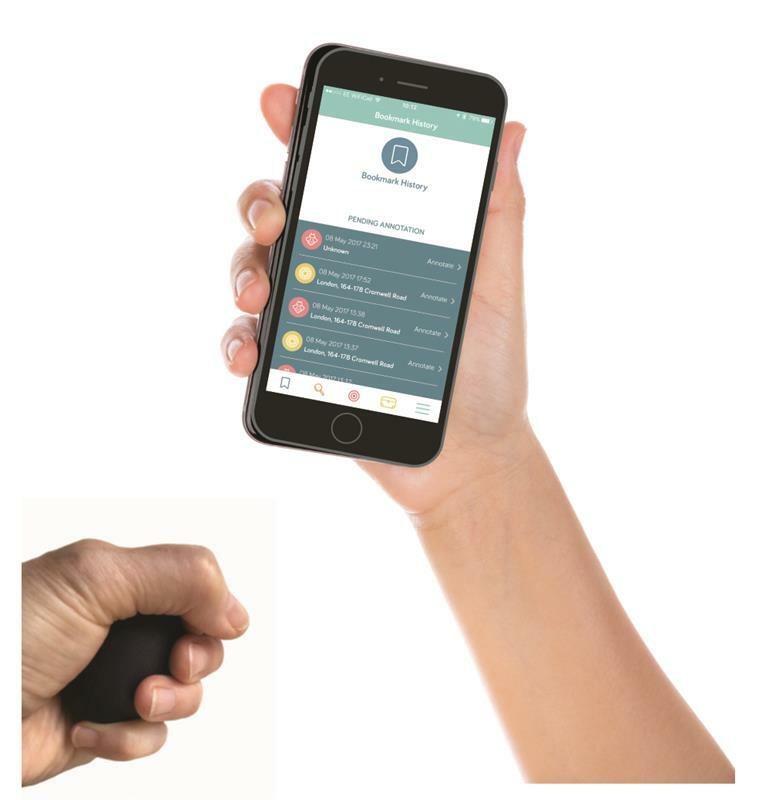 Built by tech start-up Ogenblik to address what it calls “behavioural health challenges”, OliTool comprises a handheld object connected to a smart device app which “draws extensively on validated cognitive and behaviour change approaches and practices”. The system is designed to be used for self-management, or as an adjunct to therapy. The physical interface – which is designed to be carried comfortably in a pocket – allows users to ‘bookmark’ moments when they feel anxious, by activating sensors. This logs not only the time and place when the unwanted feelings or behaviours occurred, but also their intensity. The unit also has haptic qualities which allow for the “discharge of tension by play and fidget for a calming effect”. Users are subsequently able to chart patterns in their behaviours via the app, which in turn allows them to identify potential triggers. The app also includes access to ‘psychoeducational content’ such as links to helpful resources and strategies, as well as messaging and uploading capabilities. She continues: “If you go and see a therapist, they might suggest that you keep a journal of how you’re feeling. That’s what we’re doing, but just making it easier for people. It’s a way of capturing life as it’s experienced, without having to go to your screen or open up a page on your phone or rely on memory at the end of the day. The NHS describes ‘generalised anxiety disorder’ as “a feeling of unease, such as worry or fear, that can be mild or severe” centred around “a wide range of situations or issues”. Symptoms can take the form of – but are by no means limited to – extreme restlessness and lack of concentration, alongside physical manifestations such as dizziness and even heart palpitations. Particular behaviours can also be associated with certain forms of anxiety, such as incessant checking on the part of someone suffering from obsessive compulsive disorder. With that in mind, other potential uses for the solution include compulsions or addictions. Speaking of this, Erickson says: “OliTool can be used for types of behaviours other than worry, for example if someone wanted to quit smoking or manage their weight. According to Erickson, OliTool, which is coming to the end of its development process, was initially trialled at Exeter University on students and staff experiencing anxiety, under the guidance of Professor Ed Watkins of the Psychology Department. These took place after extensive user workshops and co-design sessions. The trial took the form of what she calls a “multi-base line, randomised case study” involving a total of 13 participants, all of whom were experiencing high levels of worry and anxiety. The trial saw “some significant results” in regard to “changing certain behaviours”, as well as providing feedback on how the solution could be improved further – for instance, making the handheld unit smaller and more user-friendly. The company has since filed a patent for the product, and has also been accepted on IDEALondon’s post-accelerator programme. Ogenblik’s launch of OliTool into the market is planned for late 2018. Ogenblik conceives of OliTool as the digital equivalent of worry beads, or even something akin to mala beads, which have been used for centuries as an aid to meditation in traditions such as Buddhism. The conceptual origin of the next product up for discussion is much closer to home, and replicates something that most of us take for granted – the pancreas. Located in the abdominal cavity behind the stomach, the pancreas produces a variety of incredibly helpful hormones, as well as digestive agents including enzymes and what’s known as ‘pancreatic juice’. Probably the most well known of these hormones is insulin, which regulates the level of glucose in the body by facilitating its absorption from the blood into the cells. If the pancreas ceases to function as it should – for instance, because of diabetes – insulin has to be introduced into the body manually, and the level of glucose in the blood monitored to detect highs and lows. With that in mind, research is currently being conducted on the development of what charity Diabetes UK calls an ‘artificial pancreas’, which uses wireless comms technology to automatically keep track of glucose levels. This information is subsequently transmitted (through the use of what one manufacturer would only refer to as encrypted and proprietary technology operating in the 2.4GHz band) to an insulin pump, which then calculates and releases the appropriate amount of the hormone into the wearer. The solution – which at no point involves the use of a harvested real pancreas – is specifically intended for people with Type 1 diabetes. According to the company which produced it, the first “hybrid closed loop solution” (ie, glucose monitoring plus an insulin pump in a single unit) was Medtronic’s MiniMed 670G system, which was launched in the US in June last year. She continues: “Up until recently, the usual way for a person to administer insulin to themselves was via injection. From there, we moved on to the insulin pump, which is worn on the side of the body and carries out the process in a less intrusive way. That’s currently recommended for people who are having trouble managing their condition on their own, or who have a needle phobia. “The final piece of the puzzle has been to incorporate continuous monitoring, which involves the wearing of a sensor positioned under the skin to keep track of glucose levels in tissue fluids. “Again, this kind of technology is already being used in its own right in the form of systems such as Abbott’s FreeStyle Libre, which allows users to check their own glucose by scanning the sensor with their smartphone. For Burns, the ‘artificial pancreas’ system could be particularly useful for specific groups of patients, the most obvious being pregnant women for whom the condition can be particularly dangerous as well as difficult to monitor. According to her, last year Diabetes UK funded a trial involving 16 women who used the solution throughout their pregnancy, leading to improvements to their blood sugar levels. Staying on the subject of ongoing trials – the system has yet to be CE-marked for use in Europe – Burns says there are a number of questions still to be answered before the technology is rolled out on this side of the Atlantic. “The question is, how do you get the technology out to real life?” she says. “How do you ensure people can actually use it on a day-to-day basis, and how do you guarantee that healthcare professions feel comfortable recommending it to their patients in the first place? This clearly isn’t blue-sky thinking any more, but we still need to find out what kind of support people need. their own care to a greater degree than ever before. As ever, the wireless communications sector is a prime mover when it comes to this kind of health sector innovation.